Ah, to taste the first vibrant flavors of spring. My body sings as I devour tender violet leaves, sweet salmon berry flowers, the delicate new leaves of miners lettuce and chickweed. Many of my plant teachers have taught me that these first spring foods wake our bodies up after a winter diet. They improve our health through getting our digestive juices flowing, flushing our kidneys and liver and cleansing our bowels. Eating these foods also keeps us connected to our place. We are celebrating the birth of the season with our palate as well as our other senses. 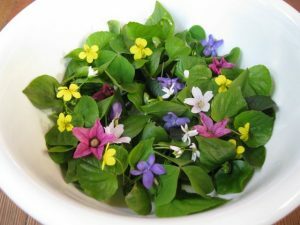 Check out the blog post on spring wild greens to get ideas on trail side snacks and gourmet salads including miners lettuce, spring beauty, chickweed, violet, dandelion and wood sorrel.